Leading international classification society Bureau Veritas has recognized MSC Cruises with the ‘8 Golden Pearls’ award for sustainable and environmental stewardship on board its ship MSC Meraviglia. The award is one of the highest globally recognized notations assigned to cruise ships for the attention paid to Quality, Health, Safety and Environmental (QHSE) management. “MSC Cruises has demonstrated its commitment to reducing the environmental impact of its operations and we commend the company for its wide-ranging, ongoing efforts in this space,” said Philippe Donche-Gay, president marine & offshore, Bureau Veritas. The ship has received the ‘CLEANSHIP’ notation recognizing the company’s efforts to meet strict environmental standards in various domains. 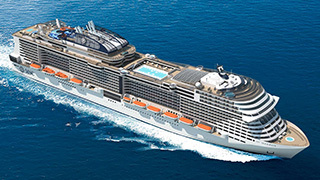 MSC Meraviglia has been sailing her inaugural summer and winter season in the Mediterranean. On 18APR, she will set sail from Genoa to spend the summer season in Northern Europe, home-porting in Hamburg and visiting locations in the North Sea, Baltic Sea, Norwegian fjords, and up to the Arctic Sea, exploring Cape North and the Svalbard Islands.